« Ask the Readers: Saving money on formula? Hi Carrie, thanks for the great post! I love Craigslist and shop/sell there often. I also advertise my “real” garage sales there and usually get a good turnout. I’m wondering if you could explain in a bit more detail why you don’t want to include the original price for an item (or perhaps, when this would be a good idea). I am thinking of selling my wedding dress on Craigslist. It’s in perfect shape and retailed for $649. In this case would you not mention it? Thanks again for the encouragement! We recently sold items on Craig’s List as one of the ways we earned enough money in one year to buy a new car for me. You can read about it here. We’ve also used Craig’s List for other things. My husband has a home improvement business and we routinely sell left over job materials and good condition, used household items that are taken out of homes during a remodel. We’ve also purchased several items with very good success. We found a terrific, well cared for John Deere garden tractor off Craig’s List at a bargin price, as well as a wood stove and freezer. appreciate the tips. we are trying to sell a bunch of stuff according to the dave ramsey advice and haven’t had as much luck as i would like. I also sell on eBay, and Craigslist is much easier if it’s an item that will sell locally. Wow Carrie what a great post I was just on craigslist last night for the first time in a while and couldnt agree with your post more! How do you get around strangers coming to your home? I mean you can’t lug a couch to McDonald’s. It makes me VERY nervous to give out my address. I’ve been without a vehicle so I’ve had to give out my adress. I’m downsizing from a house to condo wich actually works out great for me. I’m a single living woman so It’s important to be safe. I only give out half an adress and truthfully my name is not on my mailbox or buzzer. I will tell them the condo name only and they call when outside. I simply bring the item or items right out to them. My condo has cameras as well. If someone does need to come into your home, have a male present and even be sure to tell the buyer that your husband is willing to help with moving such item. It could be a friend, brother, neighbor but to them it is always your husband who will be home to help. Hope that helps you. I have used Craig’s List a few times with success. I sold a piece of exercise equipment, which necessitated that the customer come to my house, but we had several e-mail interactions and I knew she was serious. She brought her husband and I made sure others were at my home as well. I always insist that the transaction is in cash. I have also had success looking for “wanted” ads for my item before listing it to see if anyone is already looking for what I am selling. I also can’t understand why people say they are going to buy something and pick it up… then never show up. This has happened to me while selling on Craigs List too. I was taught to follow through and keep your word. Why are others so inconsiderate? It would only take an e-mail or phone call to tell them you aren’t coming! We’ve also used Craigslist to buy and sell items. This past fall we got a great deal on a pair of leather couches. I definitely agree with saving all email inquiries until the item has been picked up. Thanks for your other tips! Great tips. I have used Craigslist pretty successfully during each move I’ve done in town trying to sell furniture. There are only a few pieces I haven’t been able to get rid of and most of them were pieces of junk. I just listed them hoping to get something for them rather than throwing them in the dumpster. In our entire apartment all of the furniture is used. Either given to us or bought VERY cheap on Craigslist. You can find some really, really good deals on there. I also have bought our vaccum cleaner, curtains, kitchen appliances on craigslist too. I also have sold alot of stuff on craigslist too. Great article and craigslist advice! I have never used craigslist but will be sure to check it out now. Great tips – thankyou. I think Craigslist is great! Ha – I like your ‘dibs’ comment! I also like your advice on meeting somewhere public if possible. Craigslist is such a wonderful thing for our world too – a really easy way to keep useful things out of landfills. Thanks for posting this! I have been an avid craigslister in the Seattle area for years, mostly selling but buying too. We have probably made thousands on selling old stuff in our house that we don’t need! BUT I did learn a lot from your post! New tips on selling are always appreciated! My husband and I were just talking about trying to post something on Craigslist over the weekend and I was hoping that you could give me some insight on our situation. We have an old upright piano (old!). It needs to be refinished on the outside and a bit of tuning, but it can still be played and acutually sound pretty good if you know what you are doing. We do not want any money for it we would only want someone to take care of moving it. The concerns that I have are 1) that they would have to come to the house to pick it up and 2) do you think anyone would even be interested? Any other thoughts that you may have would be greatly appreciated too! I have made hundreds of dollars on Craigslist!!! I have literally picked up stuff from people’s trashpiles in my neighborhood and have sold it online! One man’s trash is another man’s treasure!!! I also wanted to mention Freecycle which obviously isn’t a good way to make money but it is great if you want to get rid of something that you don’t think is worth very much or isn’t selling on Craigslist. We gave away a couch that a donation company wouldn’t take in their truck because they said it was too old. I think it was because they were going to have to make a second trip to pick it up. We also love craigslist… just sold a Britax roundabout this week, but my ultimate was that we sold our car on it last year very quickly! I have been trying to contact a seller on craigslist for over a week now. I have sent 3 e-mails (there is not other contact info) and have had NO response! I don’t know if this means they didn’t get it, don’t like our offer, are waiting for more offers? This is my first experience and I am frustrated to say the least! Especially since I really would like this item! The ad stated “all offers considered” so we made an offer – do you think this is a brush off? I’m from Pueblo and I love your blog! Thank you for this post because I was wanting to sell something on Craigslist and I was worried about people coming to my house and I didn’t know if it was okay to ask to meet them somewhere. That seems a lot safer & I will definitely be using your advice. Michelle, (I am not the guest poster, but just have a little experience with Craig’slist). About the piano. I would definitely list it. If not for sale, then list it in the “free” section. I never have trouble getting rid of free items on Craig’s list. And who knows maybe someone is looking for that very item. Maybe you could try it in the “for sale” category and if it doesn’t sale after a week then list it as free. As far as someone coming to your house, maybe schedule the pick-up for when your husbnad is home or another male family member/friend can be there. Great post! Thanks so much for this! I highly recommend though (at least for the bigger ticket items like cars) that you put a phone number down (cell number for safety) and have all contact go through the phone only. (not email even through Craig’s List) We did not the first time and got some really crazy scam emails but none in the phone calls. The second time the car sold just as quickly and we only took phone calls. The really serious people will call–even those like me, who hate talking on the phone and would far rather just email. The scam emails were just a waste of time, not to mention they then get your email address if you have to respond to any questions they might have (and many seemed serious buyers at first glance). i love craigslist and use it all the time, great post, i second everything! I also love that you echo-ed exactly how i feel about picky buyers and low bid offers. Gave me confidence! One more tip: I love the free section, its amazing what people just want to get rid of and don’t think is worth anything. One mans trash another mans treasure! Ah, I love craigslist. Granted there are some strange items listed and a whole lot of overpriced junk, but you can really find some great stuff from CL. I bought most of my textbooks for a fraction of the retail cost. My sister and her fiance have gotten so many great, high quality home items from the free listings on CL. And if you’re a seller, when dealing with accepting the money with the buyer, I suggest you only accept cash. 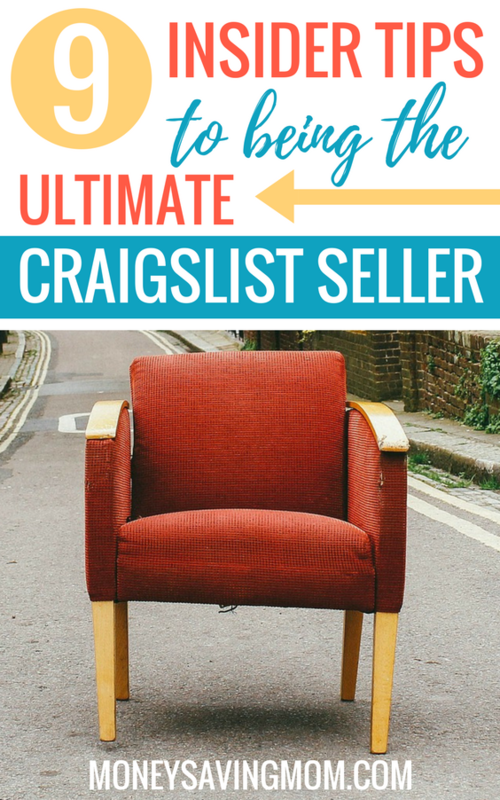 I have had great success selling things on Craigslist and love it how easy it is to post a listing and how easy it is to post quite a few photos- and it’s all free! I sold my fifteen-year-old Volvo for $2K in 2 days- because I had lots of clear pictures, along with full descriptions of everything I knew to say about the car. I’ve also sold furniture- both nice and so-so, other household items, auto and tech items, etc. I’ve noticed that sometimes an item will sit a while and then, voila, someone comes along wanting to buy it, just about when I was thinking of maybe reducing the price or removing the listing. You can also give away things on Craigslist, by the way- just like you can on Freecycle. In order to keep away spam and weirdos, I recommend doing what someone advised me to do: End all listings with “cash only, no delivery.” Even if you will deliver it, somehow saying this keeps the rif-raf away. If something is listing for over a few thousand, I would say, “Postal Service Money order only” or such. I never list my telephone number and only reveal that once I am corresponding with someone whom I trust. Even in the small town I live in, where the buyer often turns out to be someone I know or recognize, it’s best to be careful, ’cause don’t forget- the whole world can read your ad. I agree with this post as I am an avid craigslist buyer/seller. The only thing is if it is a small item then you can meet at the McDonalds on the corner, but if it is a couch for instance there really is no way around them coming to your home. Just make sure to have someone there with you like a spouse or neighbor so you aren’t meeting them alone. Michele, yes somebody definitely would take it (there is a specific free section too). As far as giving out your address, if it’s really that big, there isn’t really a way around it. Make sure the time you schedule is during the day and have a few people come over. Don’t chitchat too much (have them be in and out) so that they are spending too much time there. I do a lot with Craigslist as well. And I totally agree with all of these comments. I also think that selling kids clothes in LOTS is a great way to clean out closets. I take great pictures (upclose ones of the best outfits), describe every item in the lot with its price then total the lot at the end. This way I sell the normal stuff mixed in with the great items – it cleans out my kids closets the fastest and you make much more money than at a garage sale because it all sells that way. I price them like a garage sale though (typically $1-2/piece) so I’ve ALWAYS sold all my stuff. I also ask the buyers who were great to work with if they want me to let them know when I’m going to post the next season’s clothing. I have several (good) buyers who come to my house now every few months and clean me out before I have to list anything – it’s awesome!! And since I know them now I am fine with them coming to my house during the day when my husband is gone. New buyers I typically have come on weekends or during the evening. I highly recommend Craigslist – what a blessing! We have done pretty well with Craigslist with some things.. We have bought an Ergo brand new carrier still in box for $40 and then I sold my Graco carseat this past weekend, and today I met someone to show my van.. and they say they want it.. Prayerfully they will pick it up in the next day or so. I agree with meeting people if possible. I am not a big believer in bringing strangers to your home, but sometimes you just can’t help it depending on what you are selling. I don’t think its appropriate to be calling people asking questions about merchandise one is selling deadbeats. In fact, I find it personally insulting. Some information may be necessary to decide whether its worth seeing, worth purchasing, etc. Some ads don’t include info like: smoke free/pet free home, dimensions (can be crucial with furniture), tag may say 3T but having scrunch the garment is really the size of a 2t, etc. If one included in one’s ad all the info one could reasonably want than that’s one thing. But as a frequent buyer on craigslist, I can attest that most ads do not provide the information necessary to know if I should make a drive (sometimes many moons away) for a piece of furniture (for example). And to tell people not to respond to such inquiries is not only bad business (especially with bigger ticket items), but it shows a lack of common courtesy and sense. Its not disrespectful to ask questions. Before I can buy anything used, I have to know it comes from a smoke free home. I have a son with severe breathing issues and to waste the time to go see somthing we utilimately wouldn’t be able to use is unfair to both the seller and the buyer. I *just* pocketed $10 for a printer I posted for sale on Craigslist late last night. It was my first Craigslist experience and it went off without a hitch. I’m so happy to be rid of that old printer AND to have made a little extra money. I think people would definitely be interested in taking a free piano off your hands, even if moving it is fairly expensive (at least a few hundred). When I have to have people come to the house, I make sure my husband is home. I agree with you! We’ve had much success selling on Craigslist. It’s very nice to be able to get rid of the boys toys and make room for newer ones. Megan, whether or not I’d mention the original retail price depends on how much you’re going to charge for it. 🙂 If you paid $650 and it’s only a year old and is of a size and style that a lot of people would be desirous of, you could potentially get away with saying “I paid $650 and am only asking $100”. Michele, I’d definitely list the piano on craigslist! Our local area has lots of free pianos, as I’m guessing most locales do, so I doubt you could make money on it, but if you just want someone to take it away my guess is that you’d have no problem finding someone to take it off your hands! If a seller won’t respond to your inquiries, I’d stop contacting them. If they really want to sell something they’ll contact you right away! If it’s not sold already and they really want to sell it, I would guess they’ll repost if it’s legit! BTW, regarding getting spam emails from your listings – an easy way to tell if an inquiry email is spam is by taking note of whether or not the responder mentioned ANYTHING about the item in the email body. If it says “is the item you listed on craigslist still available?”, it’s quite possibly a spam email sent by an automated thing. For this reason, it’s a good idea to name the specific item you’re interested in if you’re inquiring about an item. Some sellers also list multiple items in one day so if you legitimately email them without mentioning what you’re interested in they’ll have no clue which one you want. Ultimately, you want to be the easiest to work with. If you need to know if an item is from a pet-free home, email and say “is this item from a pet-free home? if so, i can pick it up tonight at 6 pm! call me at 000.000.0000 to confirm”. I have made thousands of dollars selling children’s toys and clothing on craigslist over the years. I let people come to my house (generally it’s other moms buying kid items during the day) and have never had a problem. Personally, I prefer this to meeting at another location because if they don’t show up (which happens often) or show up late, it’s no skin off my nose. I have even left low value items on the doorstep and told people they could come pick it up anytime during the day so I wouldn’t be tied to the house, and I’ve never had anybody take an item without leaving money under the mat. The only real problem I’ve ever had is that one lady paid me $40 with a check that bounced. I have had a “cash only” policy since then. Although on occasion I have accepted PayPal payments and then mailed an item. People have done this for me as well, which was wonderful because it saved me from driving across town with 4 kids. For infant items and toys in “like-new” condition I think it’s fine to list the MSRP. I have always sold these items at half the MSRP and they have gone quickly. I too love craigs list. I am on a break but will be posting again soon. I’m giving my stuff a break so it won’t annoy people to see it again! It is nice when you have an account, you can repost relatively easy. I have sold things from other’s trash also! Cleaned up and a few screws added, made $45! And my friend bought her house off craigs list! My sisters and I SO LOVE Craigslist that we made our own Craigslist just for maternity and kids stuff! It’s called http://www.LaBump.com! I totally agree that good pictures are the #1 most important thing for success on sites like CL and La Bump! I’ve had a lot of unsuccessful and successful posts on craigslist. I was able to sell an old ipod dock, but it took me almost 6 months to sell it! Some of the more expensive items that I’m trying to sell, just aren’t selling. I feel like all of my items take MONTHS to sell and I’m not sure why. What are the possibilities of selling a high-end SUV? Around $39,000. Any suggestions for a single person selling large items. Most people need to know if that table, rug, bookcase is going to even fit in the room, or if it’s going to clear the windowsill, etc. I get so weary of having to constantly email sellers and ask. Really kills the “flow”.